Steve Belletto took center stage this week with his second win in the three-race California Hot Wood series for the C.L. Bryant/Union 76 Gasoline Late Models at Stockton 99 Speedway. The win also enabled Steve to capture the series crown for the third time since it’s conception in 1995. Steve notched the titles in 1996 & 1999 and now becomes the only three-time champion. Harry Belletto (Steve’s Dad) and Bob Strandwold, were in charge of the front row for the first green flag on the 100-lap race with Strandwold jumping to the early lead and Dave Byrd coming to third on lap-two. The first of four yellows fell on lap-six as Eric Schmidt got spun in turn-two. Steve Belletto and Byrd entered the feature race in a flat tie for the points with Steve starting 10th on the grid and moving to fifth by lap-25. On lap-27, Harry Belletto slowed with engine problems and stalled high in turn-two to bring out the second yellow. While under the yellow, Strandwold’s racer lost it’s spark and rolled to the pits giving the lead to Chris Wadsworth on the next green lap, with Steve Belletto coming to second one lap later. Steve Made the pass for the lead on the next circuit as a caution flag fell for Paul Guthmiller as he scrapped the front straight wall. The restart saw Steve in charge, followed by Wadsworth, Joey Zampa, Byrd, and Troy Ermish. By the mid way point fourth & fifth were covered by Greg Potts and Jeff Belletto with Zampa & Potts moving to second and third on lap-61 and Jeff taking fourth on the next pass. 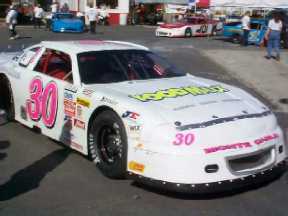 Brian Griffitts caused the next yellow with a spin off turn-two on lap-70 with Byrd pitting for a fresh tire at the time. Zampa got a bad restart and slid back to fifth behind Ron Strmiska, Jr. The event ran trouble free to the checkered with Steve holding on for the win, his 7th of the season and 16th of his career. 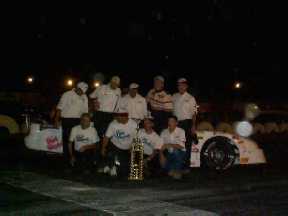 The remaining top five consisted of fast timer Potts, Jeff Belletto, Zampa, and Kevin Pugh. Byrd and Bobby Hogge IV. were heat winners with the dash falling to Harry Belletto for the 55th time in a stellar career. Byrd finished second in the series points ahead of Jeff and Harry Belletto, with Strmiska winding up fifth. The luck of the inversion draw put Grand American driver Greg Williams of Ceres on the pole for his feature event, and like the fox in the hen house, he simply ravaged the flock with a wire-to-wire 8th season win. Danny Contessotto made Williams work for the first five laps as he ran on the outside. Williams took total charge on lap-six and was never headed on his way to the checkered flag. On a 13th lap restart under a full moon, co-point leader and dash winner Paul Henry got twisted around and flew out the pit exit backwards. He was unscathed, but unable to continue in the event. John Unger moved to second on lap-15 as the laps quickly fell off the board. Co-point leader Robert Knittel was running third before a spin off turn-two on lap 23 cost him a chance for the win and lost him valuable points towards the title. Knittel now leads Henry by 11-points but the problem will now rest with Williams who climbed from 43-points back to only 28 behind. Williams, with three less events than Knittel and Henry, has quickly turned from the ‘dark horse’ candidate to a charging white stallion. And with three events left has more than enough points available to take the title away for Knittel and Henry who have traded it back and fourth all season. Unger finished second in the feature followed by Jay Linstroth, Greg Potts, and fast timer Shawn Wentzel. Returning to race for the first time this year, Scott Chappell was the first lap leader in the Pro Stock feature, bowing to Joe Hylton on lap-six. Incoming point leader Cary Treadway started second but slowed his pace during the event to fall out of the top five at the finish. Jeff Lovelace ran second at the checkered followed by Jerry Crawford, Paul Dorritty, Jr., and Doug Ollis. Mike Monez scored his first career fast time and dash win this week with heats wins going to Bob Rainey and Kevin Pugh. Danny Guibor continued his march towards a Pure Stock championship with his 10th career feature win and 5th for the 2001 season. Joey Stearns was the early leader with Guibor moving from 8th to 2nd by lap-11. The only yellow on the night came out on lap-19 as Doug Lane spun in turn-four and collected Chad Holman and Tom Bolin. Holman was in turn hit hard ending his night. Guibor took the lead on the restart and never looked back as he was chased to the checkered by Stearns, Bolin, heat winner Guy Guibor, and Ken Ratcliff. Other heats were won by Guy Guibor, Jeff Ahl, and Johnny Bird, with Danny Guibor taking the dash honors. Bryan Clark took the semi win. Guibor increased his point lead to 59-points. The Late Models return next week along with the Grand Americans, Pro Stock, Pure Stocks, and the Pro-4 Trucks.